The thunderstorm ended and the sun came out just in time for the Save Our Schools (SOS) Coalition’s rally on Thursday, May 20, in front of the administration building of Milwaukee Public Schools. In spite of the unpredictable weather, 150 people turned out to protest the budget cuts that are slashing over 300 teacher positions and programs in Milwaukee’s public schools in the coming year. Budget cuts are causing losses in arts and music classes, physical education, libraries, and social services, as well as forcing increases in class sizes. The rally began with drummers from Milwaukee High School of the Arts and then moved to a variety of speakers arguing the need for more funding to keep staff, materials, equipment, and programs so Milwaukee children can meet federal and state proficiency standards. Tina Johnson, co-chair of the MICAH education task force, outlined the following objectives of the Save Our Schools coalition: • Putting an end to the budget cuts. • Creating a panel of experts at the state level to quickly figure out the cost of a sound, basic education. 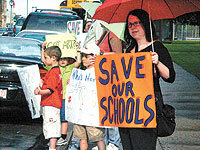 • Insuring that the state of Wisconsin provides adequate funding for schools. • Working to get MPS administration and board, city officials, and state legislators to secure more funding for MPS. • Asking the state legislature to call a special session to deal with the immediate financial crisis facing Wisconsin’s schools. Johnson was joined by other speakers, including student John Weisset from Rufus King High School, who demanded funding changes. Travanti Fowler, an eighth grade Hartford University School rapper and member of Reality Check, a hip-hop group that raps on social justice, rapped at the mic, and retiree Robert Brooks spoke in support of the tax increase Superintendent Andrekopoulos proposed. Willie Sinclair, a teacher from Bradley Technical High School explained how budget cuts mean an increase in class sizes of 35-40 students and a shortage of supplies for which to train students for technical careers. Veronica Thompson, a Rufus King High School librarian, complained about budget cuts to libraries and technology. State senator Gwendolyn Moore also spoke vowing to continue to fight for more money for our public schools. Perhaps most moving were comments by third grader Samuel Borrero of Fratney Street School. He spoke of the art teacher and art class at his school and the impact art has had in his life. Samuel’s self portrait was entered in a Youth Art Month competition and it was chosen as one of the top ten pieces that will hang in the state capitol. Superintendent Andrekopoulos, along with school board members Jennifer Morales, Peter Blewett, and Tom Balistreri were present for the rally. Later during the school board meeting most board members blamed the state government for not giving the district enough financial assistance, saying the state failed to live up to its commitment to fund two-thirds of public education in Milwaukee. SOS will hold a citywide meeting at 10 a.m. on June 5 at a yet-to-be-determined location. Call Mike Trokan at 414/964-9646 for more information. A statewide march and rally is planned for June 24 in Madison at the state capitol. Bus transportation from Milwaukee is being organized. Contact Tom Beebe at 414/384-9094 from the Institute for Wisconsin’s Future for more information.